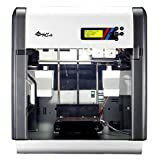 XYZ Printing Da vinci 3D Printers – 3D Calibration Ruler Test! Please visit www.DIY3DTech.com for more information on this and many other projects! As in this episode we will be printing a 3D Calibration Ruler to test the accuracy of the X, Y and Z axis of the XYZ Di Vinci so check it out and give it a try on your 3D printer. The Thingiverse link is below! ← K40 eBay Chinese CO2 Laser – Cutting Quarter Inch Cork Tiles!